Flexible, versatile, powerful and incredibly bright, the Vega Barbecue Grill Light by Zeust is the perfect tool for any grill enthusiast...and more. This fantastic light is a great replacement to your old lights and can be used not jsut as a grill ligth for bbq, but also as a work or task light, perfect for your hobby table, in the garage or around the house. 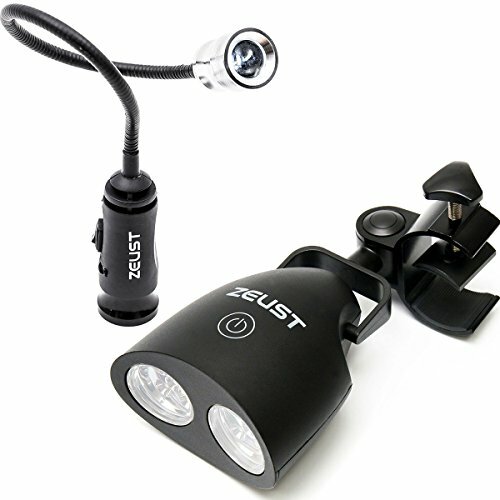 Zeust Sirius 1.0 - A Barbecue Grill Light that Turns Night into Day! Stop burning or over-cooking your food and start enjoying your night-time grilling sessions. The Zeust barbecue grill light will help you cook the perfect BBQ each and every time, leaving your friends and family wanting more. 10 super-bright LEDs for the best illumination of your entire grill surface on the darkest of nights. Very easy to install with adjustable screw clamp that fits your grill handle perfectly, round, oval or square (max diam/width: 1.45" (3.7cm). Un-matched battery strength: 3 AA batteries (included) provide up to 18 hours of power and can be extended to 50 hours with its auto turn-off feature & energy efficient LEDs making it the best BBQ grill light for various purposes. MAKE ANY GRILL MASTER HAPPY WITH THE PERFECT LIGHT! The most flexible and versatile of the Zeust product line, you can instantly upgrade your grilling experience with Capella's unique 12-inch flexible goose neck that adjusts 360 degrees. You can twist it to where you want or need light on the grill for complete illumination. While our 5-star package, waterproof cover and a "Grilling Tips" book, makes this outdoor BBQ light a fantastic gadget for any grilling enthusiast in your family. HAVE MORE FUN GRILLING WITH EASE ALL YEAR-ROUND, even in the dead of northeast winters. Durable enough to withstand sub-zero temperatures as well as extreme heat (up to 365º F), this BBQ light puts simulated daylight back into your grilling equation. The adjustable, zinc-alloy screw clamp will fit on any gas, electric or char-broil grill handle, while the SmartTOUCH technology of the power button makes this portable barbecue LED light extremely fun and easy to use. ENJOY LONG NIGHTTIME GRILL SESSIONS WITH YOUR FAMILY and end frustrations due to poor lighting on your deck. Sirius BBQ lights are easy to set-up, and have great battery life thanks to the 2xAAA batteries (included) so you can see when your meat is grilled as you like it, no matter how long it takes. No more lugging out flashlights to be able to see the grill at night. With Capella, you can expect a smooth, hassle-free barbecue with perfectly-cooked food! YOU ARE 100% COVERED BY OUR WARRANTY so you can enjoy a risk-free, 5-star buying experience when you purchase the Zeust grill light. Our mission is to bring back the fun, passion and love into your night-time grilling. That's why we are offering a 60-day money-back guarantee and a 1-year replacement guarantee. Buy once, and we'll make sure you enjoy your light for as long as you own it. The only regret you'll have is not buying one of these sooner. If you have any questions about this product by Zeust, contact us by completing and submitting the form below. If you are looking for a specif part number, please include it with your message.